Okay, so I'm getting a jump on October! It's only a couple of days early! Boris Karloff's stellar performance as Im-Ho-Tep in the 1932 version of The Mummy is a landmark in screen history. A British archaeology team accidentally revives former high priest Im-Ho-Tep, nearly 4,000 years after he was embalmed alive. Finally free, he sets out to find his lost love, a vestal virgin sacrificed in a ritual. Powerful and mesmerizing, Im-Ho-Tep is unstoppable and terrifying in this brooding horror masterpiece. As 'The New York Times' noted, "It begs description... One of the most unusual talkies ever produced." This is a great, atmospheric film that richly deserves its classic status. Superior in every way to the 99 remake, it nonetheless shares one thing with it: the mummy, Imhotep, is easily the most developed, most interesting character. Karloff's performance is spectacular, creating a character that is both cunning and menacing, but also romantic and sympathetic. What really impressed me as well was the direction of the film - how tight the story was, how much attention was in the little details and how much of the horror was subtle and understated. More was achieved with implication, with the view of the mummy's hand reaching for the scroll and the rasp of dusty bandages on the floor, than modern films achieve with jump scares. What a great film. I went ahead and watched Witches of Eastwick last night...I know it isn't horror, but that is one I tend to watch in October...like Practical Magic. So I guess I started early too. One of the most infamous and enjoyable of all the Bela Lugosi "Poverty Row" productions, The Devil Bat stands as an over-the-top horror tale. Lugosi is the embittered Doctor Paul Carruthers who seeks vengeance on his employers by creating monstrous killer bats. He begins to systematically murder his victims by offering them a sample of a specially concocted shaving lotion that attracts the flying "devil bat" with predictably lethal results. Filmed with sly tongue-in-cheek humor and a most exciting music score provided by David Chudnow, The Devil Bat ranks among Bela Lugosi's fondly remembered and best low budget fright films of the '40s. This was a cheap, cheesy, fun little film. Cheap because this is a Poverty Row film from PRC. The lack of budget is completely obvious not only in the effects, but also the sets, the average direction, and the lack of any name actors except Lugosi. Cheesy because what else can you call a film about a mad perfume maker who raises bats that he enlarges with electricity? And fun, because Bela Lugosi is a superb actor who gives it his all. He's the reason to watch the film. His fellow actors are adequate enough, but none of them has even a quarter of Lugosi's presence or talent. It's really a crime that his talent wasn't recognized by major studios in his own day. Recommended for fans of ultra-low-budget monster movies or fans of Lugosi. I had a lot of fun watching it. Anyone else may find this little film a bit too shabby for their taste. That might be in that one DVD set I got a few years ago that has 50 horror movies. I'll have to look. I know there are some Bela Legosi movies on it. I watched a few of them last year. It's in public domain, so I wouldn't be surprised if its in a 50 Horror Movie set. It's a fun watch if you like Bela Lugosi, or you like these sorts of films. I have it in two or three of the sets over here. By the way The Devil Bat was just released by Kino Classics two weeks ago on blu-ray and the reviews are positive. The '70s horror classic returns like you've never seen it before! Screen legends Christopher Lee and Peter Cushing star as rival turn-of-the-century anthropologists transporting a frozen 'missing link' aboard the Trans-Siberian Express. But when the prehistoric creature thaws and escapes, it unleashes a brain-scarfing spree that turns its victims into the eye-bleeding undead. Can the crafty colleagues stop this two million year old monster, hordes of zombie passengers and a psychotic Cossack officer (Telly Savalas) before terror goes off the rails? Silvia Tortosa (When The Screaming Stops) co-stars in this all-time fright favorite from director Eugenio Martín and the blacklisted Hollywood screenwriters of PSYCHOMANIA, now featuring explosive new Extras and a stunning HD transfer from vault elements recently unearthed in a Mongolian film depot! This is a really good little film. Of course, it doesn't hurt that it has a lot of good elements to put it together, either. 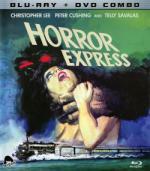 It has two superb actors - Christopher Lee and Peter Cushing - as the leads. It has Telly Savalas in a cameo. It has two beautiful ladies to threaten. It has an interesting setting - a train crossing Siberia, and a reasonably tight and action-packed script. Oh, and an interesting monster. One mustn't forget the monster. Are there a few plot holes? Sure, but you really overlook them while you're watching. The film has a great, creepy atmosphere and some genuinely tense moments. Lee and Cushing make a great team of dapper, distinguished English gentlemen. Lee looks so young and handsome here, even if he's actually in his late 40's and his character is an arrogant prig. Cushing is the more charming here. And Savalas chews up the scenery delightfully as a power-mad Cossack. It's almost a shame he comes in so late in the film, but the character would be too much if given more screen time. The other thing that helps make the film good is that the monster is very mysterious at the beginning, but as the film progresses you learn more about the creature and also eventually you get clued in toward it's motive and goal. Yes, it does have them, and it makes the creature somewhat sympathetic. I at least had some understanding and sympathy for it. The gore is minimal compared to today's films, so despite it's R rating I'd feel comfortable showing this for teens. Therefore, recommended for most anyone who's a fan of older horror films. Absolutely worth the upgrade! I have a public domain copy of the film as well, and it's like night and day in the difference between the two copies. Directed by Jacques Tourneur, Cat People is the trailblazing first of Lewton's nine horror classics. Simone Simon portrays a bride who fears an ancient hex will turn her into a deadly panther when she's in passion's grip. This is a stylish, atmospheric film with horror by implication rather than exhibition. It's horror centered on psychology, on the subtext of what deeply held beliefs mean to a person, and what jealousy can drive someone to. It's also a romantic story, and a story of romance gone cold, and of how romance and love are not the same thing. It's very strikingly filmed, with great use of light and shadow. Recommended unless you need a lot of action or gore in your movies, in which case steer clear. This is a much slower and more subtle movie. From Disney and creative genius Tim Burton (Alice in Wonderland, The Nightmare Before Christmas) comes the hilarious and offbeat Frankenweenie, a heartwarming tale about a boy and his dog. After unexpectedly losing his beloved dog Sparky, young Victor harnesses the power of science to bring his best friend back to life – with just a few minor adjustments. He tries to hide his home-sewn creation, but when Sparky gets out, Victor's fellow students, teachers, and the entire town learn that getting a new "leash on life" can be monstrous. 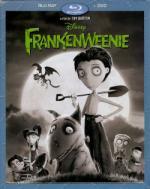 Complete with electrifying bonus features, Frankenweenie is alive with enchanting fun for the whole family. First, let me say that I am unabashedly a fan of Tim Burton's work. I've loved all of his stop motion films, and his live-action stuff is generally good too (if not as much). I love his dark, atmospheric, gothic style. I'm also a big fan of old, classic monster movies. So it's almost a given that I was going to love Frankenweenie. There's a lot of homage paid to the classics - Frankenstein, obviously, but also all the old Universal films, Gamera, heck, there's even a Bambi Meets Godzilla moment. There's some genuinely emotional moments; both mom and I teared up toward the end. There's also an interesting take on the usual theme in horror films of science as dangerous - here it is the intent behind the science that creates danger, rather than the science itself. Also the usual message about not being so judgmental, and a condemnation of mob mentality. A great film for older kids, especially ones who've seen Burton's other films, as well as adults, I can recommend this for anyone - unless they refuse to see a film where a dog dies (yes, I know that person). Happily-ever-after goes under the knife in this "eerie [and] excellent" (The Hollywood Reporter) saga of murder, madness and forbidden desire. Starring Hollywood horror great Vincent Price, this "spine-tingling thriller" (Redbook Magazine) is a "lush, elegant and bloody" (Cue) tale of razor-sharp terror! Haunted by horrifying childhood memories, the son (Price) of the Spanish Inquisition's most notorious assassin teeters on the brink of insanity. But when his adulterous wife fakes her own death to drive him over the edge, she soon discovers that betrayal cuts both ways – as the man she wants to destroy becomes not only her judge and jury – but also her executioner! Roger Corman certainly knows how to make a movie. You don't need a big budget and lots of state-of-the-art effects. What you need are good actors, suspense, and a lot of atmosphere. Vincent Price, of course, is superb. Some people consider his style a bit "hammy" but, honestly, I think they're just jealous because they'll never be as awesome as Vincent Price. The rest of the cast is pretty solid, though John Kerr's character comes off as very one-note for most of the film, and isn't as interesting as either of the others. Of course, this is really Price's show as far as the actors go. The rest is down to great art direction, a pretty interesting script that keeps the viewer guessing, and wonderful, creepy, gothic atmosphere. Recommended for anyone who likes older horror films.